1) They never claimed this. 2) They never said SD-published games will use Goo. 3) They rolled this out as competition for SecuROM, et al. Given the above, I'm starting to be boggled by the responses. You'd rather publishers who want to put DRM on their stuff keep using SecuROM everywhere? Isn't Goo a much better alternative to it? This isn't "Stardock is going to be using Goo". It's "Stardock is creating Goo so other publishers/developers have an alternative that's easier on the consumers than the existing DRM schemes". DRM is not going away. Most publishers are far too rooted in the practice. Stardock is small enough (and it's private) that it can get away with it. Publishers with rights holders can't. But I'd rather they use Goo to do it, than SecuROM. Understand what's on the table before going to complain about it like it's the next apocalypse. It's amazing how much crap a company can catch for actually listening to people and rolling out viable alternatives to help. Gamers: We hate SecuROM rootkits, installation limits, activation limits for resale. Stardock: Okay, we'll make something for publishers to use that doesn't have any of that. Gamers: WTF? Stardock DRM? Traitors!!!! This isn't "Stardock is going to be using Goo". To demonstrate the business advantages of this, we plan to use this feature of Goo ourselves on Elemental– it lowers the risk of buying a game and thus can increase sales. It's my understanding that GOO is going into Elemental. I don't have a source as I don't remember where I read it so I could be mistaken. Perhaps it's as a proof of concept for other publishers, in which case that's just good business strategy (even if it causes the loss of a few anti-DRM customers). If it's because of some expectation that DRM does any good or serves any real purpose though then boo to Stardock. Guess there's some people that will never be happy. Well, I responded in the other thread - Brad very specifically said the user deactivation feature will be used in Elemental to allow for ownership transfer on resale. Not that the DRM scheme will be used in Elemental. There is a difference And yes, by that wording it pretty much is a proof of concept. Dear Stardock, I'm sorely thoroughly dissapointed in you. I'm going to make sure to buy 2 copies of the next game I buy from them, to make up for your lost sale. Seriously. I am so. Frickin. Tired. Of you damn anti-DRM whiners. You want the company to provide everything for you, for free, without having to do any work at all, and you completely flip out when that doesn't happen. You're narcissistic zealots. If I were Stardock, I wouldn't want your money anyway. By the way, we have no problem to pay for something we want... and why in the hell we need to do some work for something that we pay !!! In any case, soon of later, pirate will break any system of protection... so, the protection will become only a problem for honest customer !!! GOO does not require an impulse install. The whole point isn't to be invincible, it's to provide a user-rights friendly alternative that other publishers can use instead of the draconian systems some of them now use. So, I havent understood completely this GOO DRM. - Does it add some sort of personal digital signature to each of the player's game binaries? - If that is the case, in what ways is this "binary with your name on it" system prevent unauthorized copying? Seriously. I am so. Frickin. Tired. Of you damn anti-DRM whiners. Meaning, buy the stuff or get away from those of us Honest enough to encourage whomever we please. Well if it weren't for the 'anti-DRM whiners' we probably wouldn't be seeing something like GOO or the Gamer's Bill of Rights. Or do you think Stardock would have come up with these things if people hadn't been whining/complaining about DRM? You want the company to provide everything for you, for free, without having to do any work at all, and you completely flip out when that doesn't happen. You're narcissistic zealots. . I don't think that's what most people that take an anti-DRM stance want. I use to not care about what DRM was on what; I buy a game and it worked, that was the way it was. Then, since 2004, I've been locked out of quite a few of my legitimately purchased games (paying hundreds of dollars I almost didn't have) due to DRM issues. I have never wanted nor needed anything for free; I only want what I paid good money for to actually work without jumping through dozens of hoops before doing a big song and dance. As for being a "narcissistic zealot", I have helped a lot of people in my life at my personal expense. Hardly a "narcissistic zealot". Let me tell you... there was a time when I could buy a game, install it from the CD on my computer, and play it. The only time I'd need the CD again was if I needed to re-install it. Nice, convenient, and nothing to intrude upon my enjoyment of the game. I bought plenty of games back in those days. If I eventually got tired of a game, I could give it away or sell it... I had that choice. In modern times, most every game requires the CD to be in the computer in order to play it. Needing to have the CD around at all times to play it results in more scratched install-discs which cannot successfully re-install the game. I've lost several games to scratched install-media. On top of that, we've got games with DRM technology that has been known to break other functionality of computers, and DRM technology which sometimes renders legally purchased games unplayable- for me, half-life 2 was incompatible with the DVD-burner drivers on my computer, and the only way I could get it to work was to uninstall the DVD burning software which came distributed with the computer I had at the time. The Witcher didn't like my system, claimed the original disc was not inserted, no matter what I did. I never got that one to work. Now Stardock is trying to do something different. Digital distribution has it's benefits- I can download the same game onto multiple computers, and as long as I only play one of them at a time, I'm fine. There's no discs to scratch, and if I need to reinstall, I can simply re-download. Unfortunately, tying games to digital distribution has downsides too. I'm not talkng theoretical here- there are several examples of companies who provided digital distribution of media, whom either chose to change their DRM schemes or shut down their servers due to poor sales, where customers who had legally purchased media lost access to content because DRM servers got shut down. Microsoft, google, and the MLB *ALL* did this. Until they come up with a mechanism for delivering goods with the same convenience and reliability which I ALREADY EXPERIENCED, I will keep complaining. What a novel concept! I remember those days. Back when a CD-burner cost the sme as a PC does today. That was a form of copy-protection too. Galactic Civilizations I, Galactic Civilizations II, Sins of a Solar Empire, and every Demigod beta so far have ALL had DRM in it: activation. In addition, virtually every piece of software, for the past 6 years has had this as well. We don't, however, put it on the CD versions and will continue that policy. Game Object Obfuscation allows us to do the above without having to modify source code and thus makes it attractive to third parties. Plus, it has features that allow users to transfer licenses and allow publishers to easily let all digital distributors support users redownloading games purchased anywhere. Any user who doesn't seen Goo as a good thing should go away and never come back because they're nuts. I'm not saying that GOO isn't a big improvement over other recent forms of DRM. It absolutely is. The one thing which gives me pause is that servers that need to be running in order to re-install the game. If stardock were to go under, be acquired, or something of that nature, the servers could be shut down, and I could end up loosing access to the products I paid for. I'm not saying you intend for this, or even haven't planned against it; valve has publicly committed that if Steam ever gets shut down, they will release mechanisms for gamers to keep all the games they purchased on steam. But looking at examples provided by microsoft, "do no evil" google, and the MLB- all of them chose to shutter DRM-based digitally distributed products, and consumers who had paid for products lost ability to access them. Looking at what happens when companies go under, they may have had the best of intentions, but shutdowns are messy, and it is very common for commitments and promises to go unfulfilled when companies shut down. I also understand that there are good reasons for you to implement DRM... but I'm still going to keep applying pressure for a "more ideal" solution. GOO looks pretty close to being ideal. If you were to tell me that GOO is set up so that all you needed to do was to email "key" files to users owning products with GOO DRM, and they could use those keys to re-authenticate their products, then you might have the problem licked- all you'd need to do would be to send a bunch of emails in the event of a shutdown- that wouldn't cost much time or money. If not, it's an improvement, but not perfect yet. Google is run by a bunch of quasi-socialists skirting the privacy laws while buying up politicians, where did this "do no evil" bit come from? If I can install the game from an archive without connecting to a server, I'm sold with no reservations. I'm guessing I probably wont be, which means I have to trust Stardock, or whatever company I'm buying the GOO wrapped game from. I do trust Stardock at present, having not been shafted yet. Paranoia and cynicism dictate that I expect to be shafted at some future date, but for now I'm ignoring my unfounded, perhaps irrational thoughts. The list of companies I trust on this front comes to a grand total of one though, so the wrappers on other peoples games are a little less than ideal. Of course, this is also the kind of system that wont be a pain later after it's been hacked. It's like the shrinkwrap on your cheese. The state of the cheese is completely independant of the wrapper, once you take it off, it's irrelevant. This system is vastly more intelligent than Securom. It wont be dialing home when I play it, disabling my cd burner, crashing the game with buggy background software, replacing drivers, any of that nonsense. It's a lock, one that seems to have the keyhole remotely stationed, but still just a lock. GOO is a good thing relative to what is out there. But so is getting hit in the head with a whiffle bat instead of being hit in the head with an aluminum bat. I would rather not get hit in the head at all, though if I have to make a choice I'll choose the whiffle bat over the aluminum bat. I hate to (potentially) hurt an argument from a CEO I actually like, but, outside of you at Stardock, no one has been able to test GOO first hand, and thus, cannot judge it from anything but previous experiences with copy protection. Granted, none of us can actually judge it at all untill we try it, but try telling us that. For those of us (i.e. me) who do not like copy protection in any form, will, at best, tolerate GOO, IF our experience with it is as good as you are predicting (and I for one hope so). Except you didn't read up on what Goo does. One of the things Goo does is work to eliminate the problem you just described. A game that uses Goo can be made to be downloaded from any service that has that game, not just the one you bought it from. There is no third-party client required. 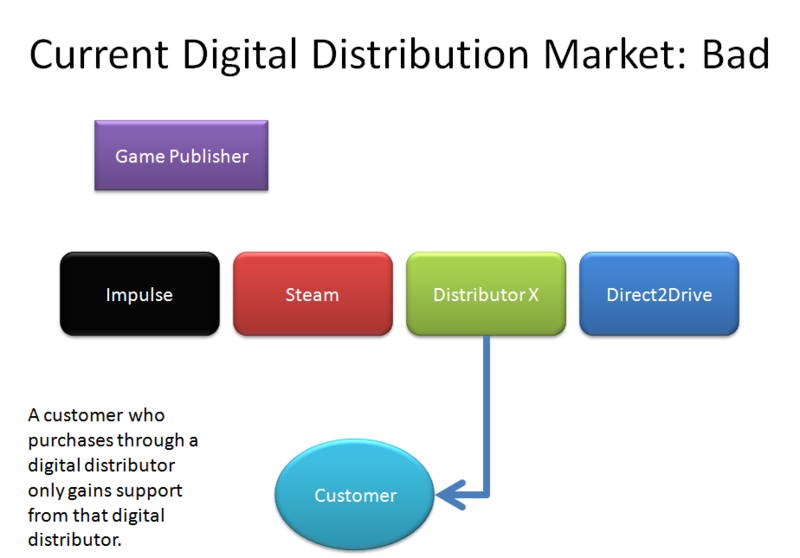 This means a developer can use this as a universal solution since it is not tied to any particular digital distributor. 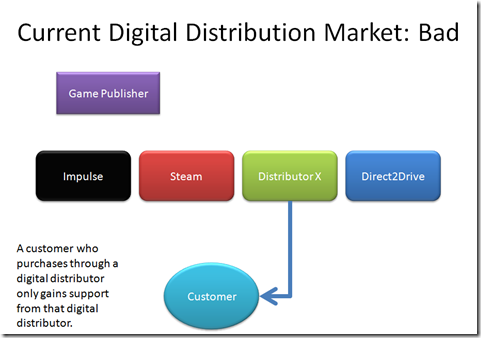 It paves the way to letting users validate their game on any digital distribution service that supports that game. 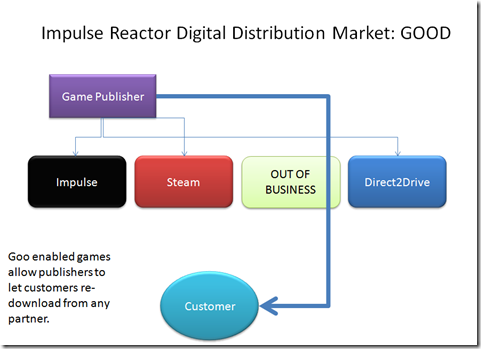 One common concern of gamers is if the company they purchased a game from exits the market, their game library may disappear too. Games that use Goo would be able to be validated anywhere. It opens the door to gamers being able to resell their games because users can voluntarily disable their game access and transfer their license ownership to another user. Except you're assuming your premise is true: "That no one outside of Stardock". It's been in the hands of publishing partners in various forms for months. This isn't something that just got whipped up. Just because it's news to end users doesn't mean it's not been seen, touched, tried out by publishers and developers. And, hundreds of thousands of users have used a more primitive version of it. If you have Sins of a Solar Empire, Galactic Civilizations, Demigod, or any non-game program from Stardock, yea, you're already using it, you just don't notice it because it's so seamless. Of course, this is also the kind of system that wont be a pain later after it's been hacked. Are you encouraging the practice with that obvious statement? Or is it, again, that Piracy tactics however adaptative they may get won't stop anyone from distributing unhackable products for a given period in such a manner that a balance sheet shows stable closing figures? I'll say it once more, i have no respect for thieves. They're in a brain jail tough enough to just go by us in total indifference while we CAN ignore what they do, did or will. The pain becomes insupportable (pun, intended). Now that I was unaware of (all of it). Nice diagrams. Nothing like pictures to make skeptics like me understand more. I still have my doubts, but thats normal with everything for me. OK, I can't think of anything else unclear to me short of actual use. Thanks for being patient with us, as takashi so elegently labled us, narcissistic zealots. So disregarding your individual opinion on DRM, this is a hot topic and a lot of us are not happy with it. That's what you (Stardock) get for doing DRM, and that's what you'll continue to get more and more.